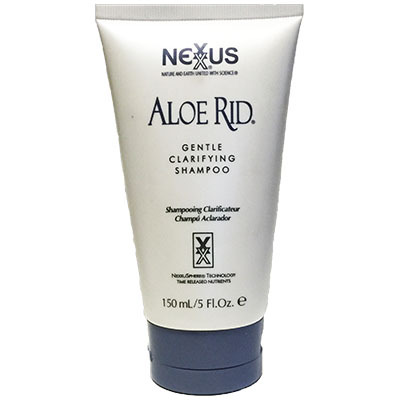 ALOE RID GENTLE CLARIFYING SHAMPOO delicately removes residual buildup, chlorine, environemental pollutants, hard water minerals and hair dulling impurities for refreshingly clean, healthy looking hair. Time released Antioxidants effectively quench damaging free radicals that are deposited by harsh chemicals. This gentle, Aloe Vera based formula conditions both hair and scalp. Use as your everyday shampoo in addition to Ultra Cleanse Shampoo. Cleans the oils from the scalp, where toxins are found use the product in the days leading up to your test. Deep cleaning formula delicately removes residual buildup, environmental pollutants, chemicals, chlorine, hard water minerals, and hair dulling impurities. Five ounces of gentle clarifying shampoo. Advanced microsphere technology provides the gradual release. Directions: Apply shampoo to damp hair. Massage into hair and scalp. Leave in 3 minutes. Rinse with lukewarm water. Repeat if needed. For deep clarifying, follow with Ultra Cleanse Shampoo treatment.